The teaching of the Church, according to which images are an integral element of the Christian Gospel from its very beginning, is also expressed in the tradition which asserts that the first icon of Christ appeared during His life on earth. In the West, this image was called "the Holy Face." In the East it is called "the image not made by the hand of man" (in Greek, ἀχειροποίητος ). According to this tradition, Christ Himself sent His image to Abgar V Ukhama, prince of Osroene, a small country between the Tigris and the Euphrates, situated at this time between the Roman and the Parthian empires. Its capital was the city of Edessa, now Orfu or Rogais. It should be noted that the chronicle of this city men­tions the existence of a Christian church which was consid­ered ancient in the year 201 when it was destroyed by a flood. The kingdom of Edessa was the first state in the world to become a Christian state (between 170 and 214, under the rule of Abgar IX). The history of the first image of Christ is acknowledged, first of all, by the texts of the liturgical service honoring the Holy Face (August 16). Here, for example, is a sticheron in tone 8 from Vespers: "Having represented Thy most pure image, Thou didst sent it to the faithful Abgar who desired to see Thee, who according to Thy divinity art invisible to the cherubim." Another sticheron from Matins in tone 4 says: "Thou didst send letters traced by Thy divine hand to Abgar, who asked for the salvation and health which comes from the image of Thy divine face." A more detailed account of the story appears in the Menaion of the month of August. It can be summarized as follows: The king of Edessa, Abgar, was a leper. He heard of the miracles of Christ and sent to Him his archivist, Hannan (Ananias), with a letter in which he asked Christ to come to Edessa to heal him. Hannan was a painter, so Abgar charged him to make a portrait of the Savior in case Christ refused to come. Hannan found Christ surrounded by a big crowd and could not approach Him. Therefore he climbed up on a rock from which he could see Him better. He tried to make a portrait of the Savior, but could not "because of the indescribable glory of His face which was changing through grace." Seeing that Hannan wanted to make a por­trait of Him, Christ asked for some water, washed Himself, wiped His face with a piece of linen, and His features re­mained fixed on this linen. This is why this image is also known under the name of " Mandylion." (The Greek word μανδύλιον comes from the Semitic word mindil , a hand­kerchief.) Christ gave it to Hannan and told him to take it, with a letter, to the person who had sent him. In the letter, Christ refused to go Himself to Edessa, since He had a mission to fulfill. He promised Abgar that once this mission was finished, He would send one of His disciples to him. When he received the portrait, Abgar was healed from the worst of his sickness, but several marks remained on his face. After the ascension, the apostle St. Thaddeus, one of the seventy, went to Edessa and completely healed the king, converting him to Christianity. On the miraculous portrait of Christ, Abgar wrote these words: "O Christ God, he who trusts in Thee will not die." He removed an idol from a niche above one of the town gates, replacing it with the holy image. Abgar did much to spread Christianity among his subjects. But his great-grandson returned to paganism and wanted to destroy the image of the Holy Face. The bishop of the town therefore walled it into the niche, after having placed a burning lamp before it. Thus the image was saved. Before the fifth century, ancient authors made no refer­ence to the image of the Holy Face. The first time we hear it mentioned is in the fifth century, in the document called The Doctrine of Addai. Addai was a bishop of Edessa (d. 54l) who, in his work (if this work is an authentic one), undoubt­edly used either a local tradition or documents which we do not know about. The most ancient undisputed author who mentions the icon sent to Abgar is Evagrius (sixth century); in his Ecclesiastical History (1) he calls the portrait "the icon made by God," Θεότευχος εἰκών. In any case, the image itself re- appeared in 544 or 545, when the Persian king Chosroes besieged the town of Edessa. The bishop Eulalius through a dream discovered the place of the niche where the icon was hidden. He uncovered it and saw the lamp still burning before it. By virtue of the image, the town was spared. The image was not only intact, but it had also been imprinted on the inner side of the tile which concealed it. In memory of this event, there appeared two different icons of the Holy Face, one where the face of the Savior is repre­sented on a piece of linen (Fig. 4 ) and another where the Holy Face is represented as it was imprinted on the tile, κεράμιον, in Russian chrepie . The original icon, i.e. the linen on which the face of the Lord is imprinted, was pre­served in Edessa for a long time as the most precious treasure of the town. In 630 the Arabs seized Edessa but did not forbid the veneration of the Holy Face, which was well known in the West and in honor of which, in the eighth cen­tury, Christians in many lands celebrated a feast, following the example of the Church of Edessa. During the iconoclastic period, St. John of Damascus mentions the miraculous image, and in 787 the Fathers of the Seventh Ecumenical Council refer to it many times. Leo, a reader of the Cathedral of St. Sophia in Constantinople who was present at the Seventh Ecumenical Council, recounts how he himself venerated the Holy Face during his stay in Edessa (2). In 944 the Byzantine emperors Constantine Porphyrogenitus and Romanus I bought the holy icon from Edessa at the price of 200 Saracen prisoners, 12,000 denarii of silver and the promise that the imperial armies would never touch Edessa and the lands surrounding it. A popular revolt resulted. Nevertheless the Holy Face was pompously transported to Constantinople and placed in the church of the Virgin of Pharos; Emperor Constantine Porphyrogenitus praised it in a sermon as the guardian of the empire. The liturgy of the feast celebrated on August 16, the Transfer of the Holy Face to Constantinople, probably dates back, at least in part, to this time. About the image imprinted on the tile, we only know that it was found in Hierapolis ( Mabbug ) in Syria. Emperor Nicephorus Phocas (963-969), following the example of Romanus I, made use of the expedition of his armies in Syria (in 965 or 968) to transport this image to Constantinople. After the pillage of Constantinople by the Crusaders in 1204, traces of the two images are lost. It is thought that the Crusaders brought the Holy Face to Western Europe, some say to Paris, others to Rome. Nothing definite is known (3). The image of the Holy Face was, of course, frequently reproduced. Some witnesses speak of a reproduction made by the king of Persia. Until recently, the oldest remaining representations were thought to be certain miniatures of the eleventh century and frescos of the twelfth century (the church of the Holy Savior of Nereditsa ) (4). But recently an encaustic icon of the Holy Face has been discovered in Georgia dating back to the sixth or seventh century, i.e., to the epoch when the miraculous image was still in Edessa (5). From the ninth century, there remains an interesting icon made in four parts which can now be found in the monastery of St. Catherine on Mount Sinai. The upper part of the icon represents, on one side, the apostle Thaddeus, and on the other side, king Abgar receiving from the hands of Ananias the linen with the Holy Face (6). In France there exists a famous icon of the Holy Face which is now preserved in the sacristy of the cathedral of Laon. It was sent from Rome to France in the thirteenth century (1249) by Jacobus Pantaleo Tricassinus, chaplain of Pope Innocent IV and the future Pope Urban IV, to his sister, the abbess of the convent of Cistercians of Monasteriolum ( Montreuil -les-Dames, diocese of Laon ). It is thought that this icon is of Balkan origin, perhaps Serbian, dating back to the beginning of the twelfth century. But in the Middle Ages there was another image of the Holy Face, which was called " Veronike " ( vera icon). It is thought that it was sent as a gift to Pope Celestine III by the great Zhupan of Serbia, Stephen II Nemania (1151-1195). It was venerated by the entire West. Pilgrimages were organized, and pilgrims returning from Rome had the Roman insignia, two keys and the effigy of the Holy Face, on their hats. A special prayer attributed to Pope Innocent III was written in its honor. In the beginning of the fourteenth century, a psalter of Arras attested that one gained forty days of indulgences for reciting it-"chi apres commence lorison du veronike. Et quicunkes le dit, il a XL jours de pardon de par l'apostiole " (7) (that is, the pardon of the Pope, guardian of the " Veronike " and bestower of the indulgence to which one was entitled for venerating this distinguished icon). Two antiphons were written in honor of this icon, one in the thirteenth century, the other in the fourteenth century. In 1527 this image was stolen and destroyed by the German and Spanish soldiers of Charles V. In the fifteenth century, when the story of St. Veronica came into being, the Holy Face of St. Peter of Rome was replaced by the theme of St. Veronica holding the linen on which the Holy Face was imprinted. The story of St. Veronica has several versions. The most famous is the one which is usually represented in the "way of the cross" intro­duced by the Franciscans (Fourth Station): When Christ was being led to the Golgotha, a woman named Veronica wiped His sweat with a piece of linen on which His image remained imprinted (8). The study of the liturgical service honoring the Holy Face provides rich information about the meaning of the image in the medieval Church. This feast is called "the transfer from Edessa to the city of Constantine of the image of our Lord Jesus Christ 'not made by the hand of man,' the image which is called the holy linen." The office of this day, however, does not only limit itself to the simple memory of the transference of the image from one place to another. The essential point of this service is the dogmatic foundation of image veneration. The image "not made by the hand of man" is primarily Christ Himself, the incarnate Word revealed in the "temple of His body" (John 2:21 ). This is why the icon of Christ is an irrefutable witness of the divine incarnation. It is not an image created according to a human conception; it repre­sents the true face of the Son of God who became man, and originates, according to tradition, from an immediate contact with His face. It is this first image of God who became man that the Church venerates on the day of the Holy Face. As we have seen, the stichera quoted above together with the other liturgical texts emphasize the historical origin of the image. As always, the Church brings us back to the historical reality, just as in the Creed the Church speaks of the Crucifixion "under Pontius Pilate." Christianity is not concerned with a "universal Christ," a personification of the internal spiritual life, nor with an abstract Christ, a symbol of some grand idea. It is essentially concerned with a histor­ical person who lived in a definite place, at a precise time. "Having saved Adam," we hear in a sticheron of the feast, "the Savior, indescribable in His essence, lived on earth among men, visible and distinguishable" (second sticheron in the first tone during Little Vespers). The scriptural readings of the day are of particular im­portance to our study. All of these readings reveal the meaning of the event which is being celebrated. Emphasizing these biblical prefigurations, they exalt their realization in the New Testament and underline their eschatological significance. The choice of the texts reveals precisely what we have already learned from the works of St. John of Damascus, i.e. how the Church understands the Old Testament's prohibition of images and the meaning and purpose of the New Testament image. First of all, we have the three Old Testament read­ings ( paroimiai ) of Vespers: two are taken from Deuter­onomy (4:6-7, 9-15; and 5:1-7, 9-10, 23-26, 28, 6:1-5, 13, 18) and the last is an excerpt from III Kings (I Kings in the Hebrew Bible), 8:22-23 and 27-30 (9). The first two readings speak of the revelation of the law to the people of Israel on Mount Horeb just before the entry of the Chosen People into the Promised Land. The meaning of the readings can thus be summarized by the fact that, in order to enter into this Promised Land and to own it, it is essential for the people to observe the revealed law and to adore the only true God with an undivided adoration, without any confusion with the cult of other "gods." One is also reminded that it is impossible to represent the invisible God: "You heard the sound of words, but saw no form; there was only a voice," and "take good heed to yourselves, since you saw no form," etc. Therefore the law in its totality, and in particular the prohibition to adore other "gods" and to make images, is an indispensable condition of entry into the Promised Land. And, of course, the Promised Land is a prefiguration : It is an image of the Church, of the Kingdom of God. The third reading is also a prefiguration of the New Testament revelation. It includes the prayer of Solomon at the consecration of the temple which he had built: "But will God indeed dwell on the earth?" asks Solomon. "Behold, heaven and the highest heaven cannot contain Thee; how much less this house which I have built!" All this alludes to the future coming of God on earth, to His participation in the course of human history, to the presence in a terrestrial temple, built by man, of the One for whom "the highest heaven does not suffice." The meaning of these Old Testament readings is more fully revealed by the Epistle reading of the Liturgy ( Col. 1:12-17) : "Giving thanks to the Father, who has qualified us to share in the inheritance of the saints in light. He has delivered us from the dominion of darkness and transferred us to the kingdom of his beloved Son, in whom we have redemption, the forgiveness of sins. He is the image of the invisible God, the first-born of all creation." Thus, the entire development of the Old Testament which defended the purity of the Chosen People, the entire sacred history of Israel, appears as a providential and messianic process, as a pre­paration for the appearance of the Body of Christ on earth, the New Testament Church. And in this preparatory process, the prohibition of images leads to the appearance of the One who was invisible, to "the image of the invisible God" revealed by the God-Man Jesus Christ. As we hear in the Vigil of the feast: "In former times, Moses could obscurely contemplate the divine glory from behind; but the new Israel now sees Thee clearly face to face" (second troparion of the fourth ode of the canon). When the days drew near for Him to be received up, He set his face to go to Jerusalem. And He sent messengers ahead of Him, who went and entered a village of the Samaritans, to make ready for Him; but the people would not receive Him, because His face was set toward Jerusalem. And when His disciples James and John saw it, they said, "Lord, do you want us to bid fire come down from heaven and consume them?" But He turned and rebuked them. And they went on to another village. And Christ turned to His disciples saying, "All things have been delivered to me by my Father; and no one knows who t he Son is except the Father, and who the Father is except the Son and any one to whom the Son chooses to reveal Him." Then turning to the disciples, He said privately, "Blessed are the eyes which see what you see! For I tell you that many prophets and kings desired to see what you see, and did not see it, and to hear what you hear, and did not hear it. The meaning of the image in the Epistle and the Gospel on the one hand, and in the first two Old Testament readings on the other hand, are opposed to each other. The Old Testament text says: "You saw no form." In the Gospel we read: "Blessed are the eyes which see what you see," i.e. "the image of the invisible God," Christ. This is why the last words of the Gospel readings are only addressed to the apostles. In fact, not only the disciples but all those who surrounded Him saw the man Jesus. But only the apostles discerned in this son of man, under His "form of a servant," the Son of God, "the brightness of the glory of the Father." As we have seen, St. John of Damascus understands these last words of the Gospel as the repeal of the biblical prohibi­tion, the repeal which for us is the visible aspect of the image of Christ whom we worship. "Formerly Thou wast seen by men," we hear in a troparion, "and now Thou appearest in Thy image not made by human hand" (second troparion of the first ode of the canon). The first passage of the Gospel (Luke 9:55 -56) draws a sharp distinction between the apostles and the world. In fact, it shows what makes the Church different from the world: the spirit and the ways which are the Church's alone and which are not the world's. (Remember that it is this difference which determines the Church's modes of action and, in particular, its art.) On the one hand, the Old Testa­ment readings explain why images were prohibited. The Gospel, on the other hand, reveals the purpose of the image. Note also that this difference of the spirit and the ways of the apostles with those of the world is noted by Christ just before His entrance into Jerusalem. Starting with the Old Testament readings and moving to the New Testament readings, we see a developing revelation through symbolic images: The Old Testament is a preparation for the New Testament; the Promised Land is an image of the Church. The New Testament is the realization of these preparatory prefigurations. But the New Testament itself is not yet the final end: It is only another step towards the Kingdom of God. Thus in the Old Testament the confession of the true God and the absence of His image were essential conditions for the people to be able to enter the Promised Land and possess it. In turn, in the New Testament the confession of Christ and of His image, the declaration of our faith in this image, plays an analogus role: It is also an essential condition to enter the Church and, through the Church, the Kingdom of God, that celestial Jerusalem towards which the Church is leading us. This is why this passage of the Gospel is read precisely on the day when the Church celebrates the icon of the Holy Face. It is Christ Himself who leads His apostles into Jerusalem. As for us, it is His image which leads us into the celestial Jerusalem. A hymn of the feast proclaims: "We praise Thee, the lover of man, by gazing upon the image of Thy physical form. Through it, grant unto Thy servants, O Savior, to enter into Eden without hindrance" ( sticheron in tone 6). Thus, by the simple choice of liturgical readings, the Church unfolds before us the impressive picture, showing the slow and laborious progress of the fallen world towards the promised redemption. Besides the image of Edessa, there must have been other representations of Him made by persons who had seen and known Him. This tradition is expressed, for example, by the statue of the hemorraging woman. These portraits served as models for the images which were made later. Very few of these ancient images of Christ have survived. In general, most of the monuments of sacred art, particularly those of the Eastern Christian world, were destroyed by the iconoclasts and, later, by the Crusaders or simply by time. There remain, above all, frescos in catacombs, particularly in Rome. As we know, these are direct and not symbolic representations of Christ. Many of His representations in the catacombs of Pretextatus and of Olistus, dating back to the second century, are a part of biblical scenes. He is sometimes represented as an older man, with a beard, as in the scene of the Samaritan woman (the catacomb of Pretextatus, Fig. 5). Sometimes, however, He is young and beardless. In the following cen­turies, the number of images of Christ continuously increases. It is necessary to mention here what some historians call a "controversy" in the writings of the authors of antiquity and the Fathers concerning the physical aspect-the beauty or ugliness-of Christ. This so-called discussion began in the second century. Among the fathers and ecclesiastical writers, some, such as St. Justin Martyr, Clement of Alexandria, Tertullian, St. Cyril of Alexandria and St. Irenaeus, assert that Christ was ugly. They base their argument on the idea of the kenosis of the emptying, the abasement of God and on the words of Prophet Isaiah: "He had no form or comeliness that we should look at him, and no beauty that we should desire him" (Isaiah 53:2-3). These writers understood literally the words of St. Paul : "But He emptied himself, taking the form of a servant" (Phil. 2:7-8), and believed that Christ could not have an attractive physical aspect. Other Fathers, such as St. Gregory of Nyssa, St. Ambrose of Milan, St. John Chrysostom, St. Jerome, and also Origen, believe that Christ was physically very beautiful. They base their opinion on other prophecies, such as Psalm 44 (45): "Thou art the fairest of the sons of men." As for the words of Isaiah on the absence of beauty in the humiliated servant, they understand this to speak of Christ during His Passion. The very names of these writers show that there could not have been a "controversy" among them on this topic. Each of them simply expressed his opinion on the matter, but not one, I think, placed any great importance on it. It is characteristic that most of those who believed in the ugli­ness of Christ lived in a pagan world and were, therefore, fierce enemies of the ancient conception of beauty. An ugly Christ was psychologically more understandable to them. On the other hand, most of those who believed in the beauty of Christ lived in a time when the beauty of antiquity was con­sidered to be less of a challenge to Christianity. For them, beauty was not necessarily pagan and sensual. It could express the radiance of an internal, spiritual beauty. Church Tradi­tion, as it is reported by St. John of Damascus among others, appears to solve this so-called controversy. It asserts that the messenger of king Abgar could not make a portrait of Christ because of the supernatural radiance of His face. Thus, the issue of His beauty clearly transcends the usual meaning of the word: It is an issue of internal and spiritual beauty. This so-called controversy is sometimes used in arguments to prove the absence of an "authentic image" of Christ. But actually, no argument based upon the categories of secular aesthetics can prove anything. One person can find Christ, as He is represented on an icon, beautiful; another can find Him ugly. It is a matter of conditioned subjectivity, which would allow one person to appreciate a portrait which others do not. Divergences would increase if the same face was represented by different painters. Besides the rare direct images of Christ, many symbolic or allegorical representations of Him can be found, either painted in the catacombs or sculptures in bas or high reliefs. Excluding animal or vegetable symbols, the representation of the Good Shepherd is the most important of those representations using the human form. This image is directly linked with that of the Lamb and is based on biblical texts, for example, Ezekiel 34 and Psalm 22, in which Ezekiel and David see the world as a sheepfold with God as the shepherd. Christ, when speaking of Himself, takes up this biblical image: "I am the good shepherd," He says (John 10:14 ), or "I was sent only to the lost sheep of the house of Israel " (Matt. 15:24 ). Some authors of antiquity, such as Clement of Alexandria or St. Abercius, bishop of Hierapolis, also use the image of the Good Shepherd. In this figuration, Christ is always represented as a slender and elegant young man, beardless, his hair either long or short. Sometimes He holds a scroll of the Scriptures in His hand, sometimes a shepherd's staff. The image of the Good Shepherd appeared in the Roman catacombs in the first century. There are, in particular, many in the catacomb of Domitilla. Christ is seen either surrounded by sheep or carrying one sheep on His shoulders. The latter type of iconography is not of Christian origin. Pre-Christian art also used this image. With fore­boding, it seemed to express an archaic myth of deliverance by a good god: In ancient Greece, it was Hermes, the protector of the herd, and in more ancient Indo-European mythology, it was the god-liberator of cows. The image of the Good Shepherd carrying a sheep on His shoulders was also known in Etruscan art. However in Hellenistic times it simply be­came a "scene from nature." One could also ask whether the mystery cults did not give it a new, soteriological value. In any case, Christianity adopted this iconographic type and gave it a precise, dogmatic meaning, which simultane­ously fulfills its primitive foreboding and completely renews it in the historical certainty of the salvation through Jesus Christ: The Good Shepherd-not dreamed about, but incar­nate-takes upon Himself the lost sheep, that is, according to patristic commentaries, fallen human nature, humanity which He unites to His divine glory. It is the deeds of Christ and not His historical form which are explained in this scene. It is almost an image of a hero of antiquity, such as, for example, the young solar god, Apollo. In no way can it be likened to the image of an adolescent Christ, or Emmanuel. Another symbolic image of Christ is also borrowed from ancient mythology. This is the infrequent representation of Christ as Orpheus, with a lyre in His hand and surrounded by animals. Christians used this image as yet another way to express the eminence of a divine teaching. Just as Orpheus subdued wild beasts and charmed the mountains and trees with his lyre, so also Christ attracted men with His divine word and subdued the forces of nature. This symbol was also frequently used by the writers of Christian antiquity, starting with Clement of Alexandria. Such symbolic repre­sentations of our Lord, as well as the symbols borrowed from the animal world, gradually lost their meaning and disap­peared from the liturgical life of the Church. Let us now consider the first representations of the Mother of God, which tradition also dates back to the time when she lived on earth. If the icon of Christ, the foundation of all Christian iconography, reproduces the traits of God who became man, the icon of the Mother of God, on the other hand, represents the first human being who realized the goal of the incarnation: the deification of man. The Virgin is the first of all humanity to have already attained, through the complete transfiguration of her being, that to which all creatures are summoned, and who has raised herself above the celestial hierarchy, she who is "more honorable than the cherubim and more glorious beyond compare than the sera­phim." She has already passed the limit of time and eternity and now finds herself in the Kingdom which the Church awaits with the second coming of Christ. She who "contained the uncontainable God" presides with Christ over the destiny of the world. This is why the icons of the Virgin play a particularly important role. In our churches, in our worship, they are parallel to those of Christ Himself. In the private life of the faithful, these icons also play a very important role. Orthodox tradition attributes the first icons of the Virgin to the Evangelist St. Luke. According to this tradition, St. Luke made, after Pentecost, three icons of the Virgin: two with the Child and the third without. One is of the type called Hodighitria ( Ὁδηγήτρια, fig. 6), which means "She who leads the way." Both the Virgin and the Child are repre­sented full face, turned toward the spectator. This austere and majestic image particularly emphasizes the divinity of the Christ-Child. Another image is of the type Umilenie ( Ἐλεοῦσα, fig. 7), "Our Lady of Tenderness." It represents the mutual caress of the Mother and Child. But it portrays more than the natural human feeling, the tenderness of motherly love. It is the image of a Mother who suffers deeply for the anguish which awaits her Child in a silent conscious­ness of His inevitable suffering. As for the icon representing the Virgin without the Child, the facts about it are confused. It is probable that this icon is connected with the composition known as Deisis , that is, the Virgin and St. John the Baptist praying to Christ. Actually, a score of icons of the Virgin attributed to St. Luke are found in the Russian Church alone. Besides these, there are twenty-one on Mount Athos and in the West, of which eight are in Rome. Obviously, it cannot be maintained that these icons are themselves made by the hand of the Evangelist, since nothing which he painted has survived. For example, among the old reproductions of the Virgin of the Umilenie type, we do not know of one which dates back further than the tenth century (10). Of the Hodighitria type, those prototypes which we know of date back to the sixth century (the Rabula Gospel) (11). But those icons which are said to be St. Luke's form a tradition for which he may have provided the prototypes. Similar expressions are used when one speaks, for example, of an "apostolic liturgy" or of "apostolic canons": These date back to the apostles not be­cause they were written by their hand, but because they have an apostolic character and are covered by apostolic authority. The tradition which attributes the first icons of the Virgin to St. Luke is transmitted by liturgical texts, particularly those of the feasts consecrated to the Virgin, such as the feast of Our Lady of Vladimir, an icon of the Umilenie type (August 26). During Vespers, the following sticheron in tone 6 is sung during the Litia : "When for the first time your icon was painted by the announcer of evangelical mysteries and was brought to you so that you could identify it and confer on it the power of saving those who venerate you, you rejoiced. You who are merciful and who have blessed us be­came, as it were, the mouth and the voice of the icon. Just as when you conceived God, you sang the hymn: 'Now all the generations will call me blessed,' so also, looking at the icon, you say with force: 'My grace and my power are with this image.' And we truly believe that you have said this, our Sovereign Lady, and that you are with us through this image..." During Matins, the first hymn of the canon in praise of the Virgin, tone 4, is: "Painting your all-honorable image, the divine Luke, author of the Gospel of Christ, inspired by the divine voice, represented the Creator of all things in your arms." 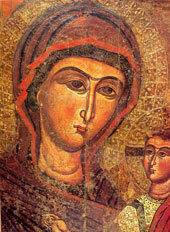 The latter text simply states that the first icon of the Virgin was made by St. Luke. But the former asserts that the Virgin herself approved her image and conferred on it her grace and her power. The Church uses this same text for the feasts of different icons of the Virgin. By this, the Church emphasizes that this power and grace of the Virgin are transmitted to all of the images which reproduce the authentic traits of the Virgin as she was represented by St. Luke. This is why the supposed images of the Virgin which are painted from another model can never have this unique advantage which the traditional icons have: to be carriers of all the power of the Virgin-this being true for the simple reason that they have nothing in common with the Mother of God. The oldest historical evidence which we have about the icons painted by St. Luke dates back to the sixth century. It is attributed to Theodore, called the Reader, a Byzantine his­torian in the first half of the century (around 530) and a reader in the church of St. Sophia in Constantinople. Theo­dore speaks of an icon of the Virgin Hodighitria sent to Con­stantinople in the year 450, which was attributed to St. Luke. It was sent from Jerusalem by the Empress Eudoxia, wife of Emperor Theodosius II, to her sister, Pulcheria. St. Andrew of Crete and St. Germanus, Patriarch of Constantinople (715-730), also speak of an icon of the Virgin painted by St. Luke, but which was found in Rome. St. Germanus adds that the image was painted during the life of the Mother of God and that it was sent to Rome to Theophilus, the "excellent" Theo­philus who is spoken of in the prologue of the Gospel of St. Luke and in the Acts of the Apostles. Another tradition tells of an icon of the Virgin which, after having been painted by St. Luke and blessed by the Mother of God, was sent to the same Theophilus, but to Antioch rather than Rome. Accord­ing to the tradition, this is probably the prototype of the icons which now exist in our Church under the name of Tikhvin (celebrated on June 26; the Tikhvin icon is now preserved and venerated at the Cathedral of the Holy Trinity in Chi­cago, Illinois). After the death of Theophilus, this icon sup­posedly was brought from Antioch to Jerusalem, and, from there, to Constantinople (12). It is possible that this is the same icon of which Theodore the Reader spoke. But this fact is difficult to ascertain, because here probably were many re­productions of icons by St. Luke brought to Constantinople. In any case, among the icons found in Russia and attributed to St. Luke, five reproduce prototypes once brought from Jerusalem to Constantinople. It is possible that among those which exist in the West, there are also some which had once been brought from Jerusalem to Constantinople and that it is about one of these that Theodore the Reader speaks. The famous document in the defense of icons addressed to Em­peror Constantine Copronymus and attributed to St. John of Damascus also speaks of an image of the Virgin painted by St. Luke (13) . These are the remains of a very old tradition which still lives today in the Christian people. As we have seen, there are two traditions about the icon which St. Luke sent to Theophilus. The Patriarch St. Germa­nus speaks of an icon brought to Rome, while another tradi­tion asserts that this same Theophilus possessed an icon of the Virgin painted by St. Luke, but in Antioch. That Theo­philus, an important person, could have had two icons of the Virgin, one in his house in Rome (since he was of Roman origin) and another in Antioch where he was retained by his work, is not impossible. St. Luke was a painter, and he surely did not limit himself to painting only one icon of the Virgin. Moreover, Church tradition, as we have seen, attributes sev­eral to him. In any case, from the fourth century on, when Christianity became the religion of the state and there was therefore no danger in exposing sacred objects, the icon of Theophilus, which until then had remained hidden in Rome, became known to an ever-growing number of Christians. The icon itself, or a reproduction, was moved from a private house to a church. And, in 540, Pope St. Gregory I (590-604) car­ried the venerable icon of the Mother of God, "which is said to be the work of St. Luke" ( quam dicunt a sancto Luca factarn ), to the basilica of St. Peter in a solemn procession and with the singing of litanies. Other than the images painted by St. Luke, tradition also tells us of an icon of the Virgin made in a miraculous way and not by the hand of man. Thus, during the liturgical serv­ice commemorating the icons of the Virgin of Kazan (Octo­ber 22), we hear in the third ode of the canon: "The divine apostles of the Word, announcers of the Gospel of Christ to the universe, built a divine church consecrated to your holy name, O Mother of God. Therefore they came to you, our Sovereign Lady, asking you to come to its consecration. But you, O Mother of God, said to them: 'Go in peace, and I shall be there with you.' And when they went, they found on the wall of the church a likeness of your image, O our Sov­ereign Lady, made in colors by a divine force. When they saw it, they fell down before it and glorified God. And we also with them..." According to Tradition, the apostles in question are St. Peter and St. John. After having converted many people in the town of Lidda, later called Diospolis, near Jerusalem, they built a church consecrated to the Virgin. They then went to Jerusalem to ask the Virgin to come to the consecration of this church. The Virgin sent them back with the promise to be there with them. Upon their return to Lidda, they found in their church an image of the Virgin on the wall, or, according to other sources, on a column (14). This image is called Our Lady of Lidda and is celebrated on March 12 (15). In the eighth century, St. Germanus, the future patriarch of Constantinople, passing through Lidda, had a reproduc­tion made of it which he sent to Rome during the time of the iconoclastic controversy. After the defeat of iconoclasm, it was returned to Constantinople. From this time on the image of our Lady of Lidda was also called our Lady of Rome (celebrated on June 26). The very first icons of Christ and of the Virgin which served as prototypes for all later icons have not survived to our own times. The very material with which an icon is made does not last forever. An icon cannot last indefinitely, and if we have several rare icons which date back to the fifth century, they too will soon no longer exist. Besides, man at times does everything he can to destroy this ancient evidence. Iconoclasm, for example, was a true disaster. Everything which could be destroyed was systematically done away with, and we now can no longer say what icons from early Chris­tian times were like. All that can be asserted is that the most authentic evidence was found in Syria and Palestine. But, in effect, all that remains from the first centuries of Christianity are the frescos in the catacombs, particularly in Rome, bas reliefs of sarcophagi and the remains of various sacred ob­jects, also found particularly in the catacombs. The Virgin is represented in the catacombs at least as often as Christ. But while Christ is primarily represented symbolically, the Virgin is always represented directly. The oldest representation of the Virgin which we know of dates to the second century, and some scholars even think that it may date back to the first (16). It is found in the catacomb of Priscilla in Rome and represents the Mother of God sitting with the Child on her lap, with a prophet at her side pointing at a star (fig. 8). A fresco dating to the beginning of the second century and representing the adoration of the Wise Men can also be found in this catacomb. It is, however, prac­tically effaced. The adoration of the Wise Men was fre­quently represented in the first centuries of Christianity and was a separate feast in the liturgical year, as is still the case in the West. (The East celebrates it together with the feast of the Nativity.) In the Roman catacombs, ten or twelve images of the adoration of the Wise Men can be found, dat­ing from the second to the fourth centuries. The Virgin is always represented sitting down, holding the Child on her lap and receiving with Him the adoration of the Wise Men, which particularly emphasized her dignity as the Mother of God. This iconographic theme is not only important histor­ically; it is not simply an illustration of a celebrated event. It answered a very piercing question of that time: that of the role of the Gentiles, i.e. of the non-Jewish nations, in the Church. This no longer poses any problem for us, but in the first centuries, the problem of the Gentiles, of the pagans who entered the Church, the house of Israel for which Christ had come, was very acute. It was the source of a controversy between the Apostles (Acts 11:1-4) and was discussed at the apostolic council (Acts 15). It played an important role in the life of the first Christians (for example, Acts 6:1). Images frequently and in different ways reflected this prob­lem. The Wise Men coming to adore Christ were the fore­runners of the nations, the first-fruits of the Church of the Gentiles, i.e. of the non-Jewish Church. This is why the Chris­tians of the first centuries, through the representation of the worship of the Wise Men, emphasized the place of the non-Jewish Christians in the Church, the legitimacy of their minis­try parallel to that of the Christians of Israel. Even in the sixth century, mosaics in the church of San Vitale in Ravenna represent the adoration of the Wise Men embroidered on the robe of the Empress Theodora, in that famous scene which shows her with Emperor Justinian, carrying gifts to the Church. Thus, the imperial couple re-enacts the action of the kings of the Orient, carrying gifts to Christ in the name of their people. Apart from icons of the adoration of the Wise Men, the Virgin appears in other iconographic scenes, for example, the annunciation (catacomb of Priscilla) and the nativity (cata­comb of St. Sebastian, fourth century). She is also often repre­sented alone, as an Orans , i.e. with arms lifted in prayer. This latter image emphasizes her role as the mediator before God for the Church and for the world. And it is usually in this pose that she is represented on the bottoms of many sacred vases in the catacombs (Fig. 9). She also sometimes appears surrounded by the apostles Peter and Paul and others, or else with her mother, St. Ann. Following the images of Christ and the Virgin, there ap peared images of apostles, prophets, martyrs, angels, etc.-in other words, a variety of Christian iconography. Thus we find in the catacombs from the first century, representations of Noah's ark, Daniel in the lions' den, etc. In short, many elements of present-day Orthodox iconography gradually ma­terialized between the first and fourth centuries. (1) IV, cap. 27, PG 86: 2745-2748. (3) Tradition has it that there is another icon of Christ which was "not made by the hand of man," an icon named after the place where it appeared, the town of Kamuliana in Cappadocia. This image was transported to Con­stantinople in 544 and played an important role in the life of the Byzantine Empire. However in the eighth century it seems to have been forgotten. It is thought that it was destroyed by the iconoclasts. In any case, it is not mentioned in our liturgical texts. (4) A, Grabar, op. cit., p. 21. (5) Α miranachvili, Istoria gruzinskogo iskusstva ( Moscow, 1950), p. 126. (6) G. and M. Sotiriou, Εἰκόνες τῆς Μονῆς Σινᾶ. Reproduction t. I, ( Athens, 1956), tab. 34, text t. II ( Athens, 1958), pp. 49-51. (7) «Hereafter begins the prayer of the ' Veronikë.' And whosoever recites it receives 40 days of pardon through the apostolic father." (8) On the subject of the Holy Face of St. Peter of Rome and the image of St. Veronica, see Paul Perdrizet's article in Seminarium Kondakovianum, vol. 5 (Prague, 1932), pp. 1-15. (9) We do not take these readings from the Menaion but directly from the Bible, because in the Menaion they are abridged and some passages important for the understanding of the meaning of the image are omitted. (10) In the church Toqale Kilisse -963-969. V. Lazarev, Istoria vizantiiskoi zbivopisi, t.I, p. 125. (11) N. Kondakov, Ikonogmjia Bogomateri, t. I, pp. 191-192. (12) G. S. Debolsky, Dni bogosluzheniia, vol. I (Saint Petersburg, 1901), p. 188. (13) This document, according to recent scholarship, belongs to an unknown author and consists of homilies by St. John of Damascus, St. George of Cyprus and John of Jerusalem. G. Ostrogorsky, Seminarium Kondakovianum 1 ( Prague, 1927), p. 46. (14) G. S. Debolsky, op. cit., p. 168. (15) The oldest written evidence we have about this dates to the eighth and ninth centuries. These are a passage attributed to St. Andrew of Crete and written about the year 726; a synodal letter written by the three patriarchs of the East to Emperor Theophilus, an iconoclast, in 839; and a work of George, called the Monk, written in 886-887. We know nothing definite about what happened to this image except that it still existed in the ninth century. Dobschiitz, Christusbilder (Leipzig, 1899-1909), pp. 79-80. (16) Pokrovsky, op. cit., p. 64.